Here's a card that I made with some Taylored Expressions supplies. I started with a sheet of smooth Bristol paper, onto which I smooshed a few different colors of TE liquid watercolors (Candy Corn, Cherry Pop, Guava and Lemon Meringue). Once dry, I die cut leaves using the Mini Leaves dies. I've had these die cut leaves sitting on my craft table for several days now and decided that it was time to put them on a card. I was inspired to arrange them to create a fall wreath. 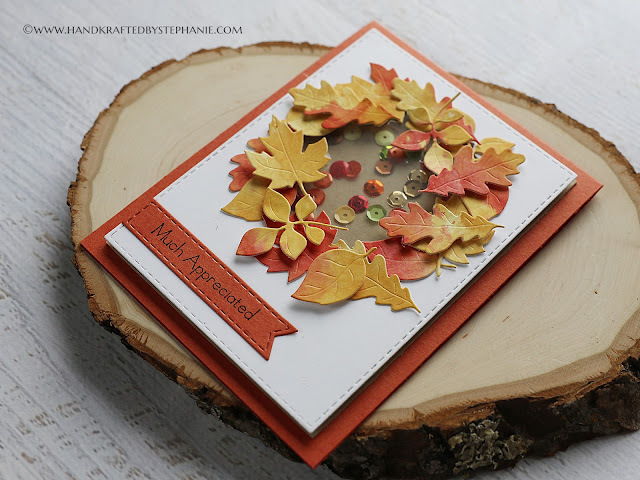 I die cut a circle to put my leaves around and decided to create a shaker card, adding various sequins in fall colors. I then added the leaves around the circle, first adhering the base with liquid glue, then popping up some leaves on top with foam tape. The sentiment is from Love Grows Here. That's it for me today! Thanks so much for stopping by!